Informational Topics that are no longer on the first few pages. New addition - Patrick Henry Magistrate. Like the Phoenix not necessary a “rare” can but always had my eye on this can and decided to finally pull the trigger. EDIT: Added my current favorite 10 Michigan cans. Still looking for clean Honer’s HP, Goebel OD, and White Goebel Bock. Anybody else care to post their current or past favorite Michigan cans? Let’s see them...I know there are some cool collections out there! Last edited by Clarkston1 on Sat Sep 29, 2018 11:55 am, edited 3 times in total. I remember about 10 years ago when Ted Larsen had a small find of 2 mint ones. First one sold on Ebay for about $2,000 & the next week his 2nd one sold on ebay for about $2,500 if I remember right. a record for that can at that time. I think $1,000-$1,500 much more reasonable & realistic for a mint one nowadays. LEON. Everybody's top ten list should be updated to add the Schmidts Quart Natural Brew. Pic below. LEON. Since this post has been made I’ve dumped 2 of the Frankenmuth cones with the black line. That 16 oz strohs fan tab is no slouch. I’ve only seen literally only a handful. 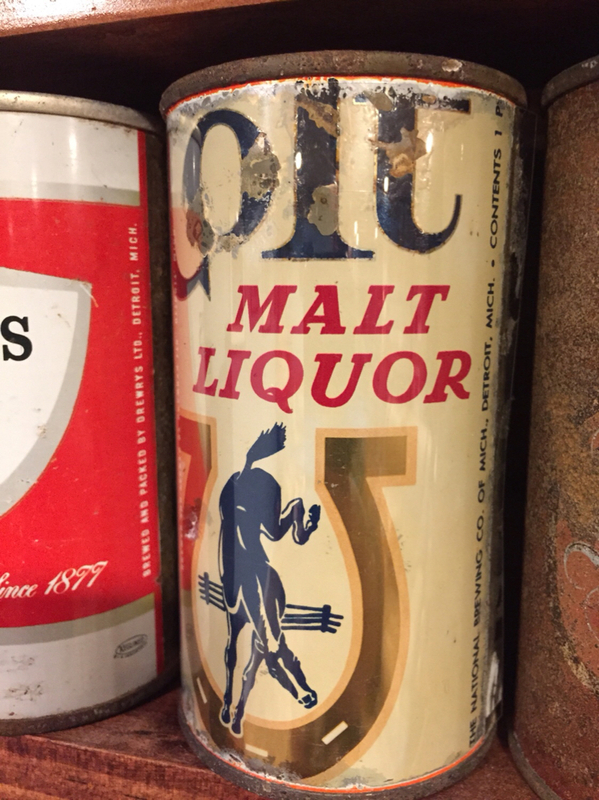 Great grouping of Michigan cans, I’ve never seen the red Altes 16oz in person, sharp can. Whatever became of the soupcan Pfeiffer OD? I always had a hard time believing it was an authentic period OD can. Last edited by Clarkston1 on Sun Sep 30, 2018 4:06 pm, edited 1 time in total. Storzman, Nicest 16.oz Altes zip I've ever seen. Much better then my indoor but spotty grade 2- or 3. If you ever decide to sell let me know. LEON. Dumped this Schmidts Quart this Spring in the U.P. Grade 11 on 1-10 scale. Was total mystery can when found, acid revealed a Schmidts, BUT, Unfortunately it did not reveal if the "NO SUGAR NO GLUCOSE" variation or the much rarer "NATURAL BREW" variation. Last edited by Leon on Sun Sep 30, 2018 3:37 pm, edited 1 time in total. Yeah, that can should be added to list. LEON. P.S. but most likely was originally intended to be made as a pull tab & think OP only asked for flats & cones to be listed. Wow - kamsquared - that is cool - never seen that can from Detroit - only from Baltimore, what is story on how it came to be cut down to 12oz height? It is a paintover under a Grandpa Grafs Orange soda. The Grafs is a 12oz so the sheet of 16 oz Colts (3 deep) were painted over by 4 deep of 12 oz Grafs. I got lucky enough to find the middle of a sheet which cut off a bit of the top and a bit of the bottom of the Colt. Somewhere out there are orange Graf's with the bottom cut and the tops cut....not sure how many sheets. Had a chance to upgrade my old dumper. Tough to get this Frankenmuth clean, a sleeper of a can. Nice upgrade at what I thought was a reasonable price. That is one of the better downgrades I've seen.